TOKYO (Reuters) - Japan's government has budgeted over $15 million to fund Japan studies at nine overseas universities, including Georgetown and Massachusetts Institute of Technology, as part of a "soft power" push to counter the growing influence of China and South Korea. The program, the first time in over 40 years Japan has funded such studies at U.S. universities, coincides with efforts by conservative Prime Minister Shinzo Abe's administration to correct perceived biases in accounts of the wartime past - moves critics say are an attempt to whitewash history. The Massachusetts Institute of Technology (MIT) and Georgetown University in Washington, D.C. will receive $5 million each from the foreign ministry's budget for 2015/16 from April, which has yet to be enacted, a finance ministry official said. That comes on top of $5 million in an extra budget for 2014/15 for Japan studies at New York's Columbia University, where Japan scholar Gerry Curtis will retire late this year. 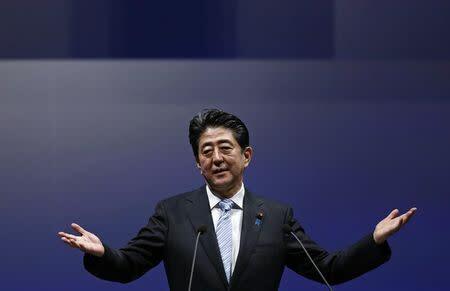 "The Abe government has a sense of crisis that history issues concerning Japan ... are not properly understood in the United States, and decided to make a contribution so that Japan research would not die out," the finance official said. The finance ministry official said that Japanese diplomats would vet professors hired for the programs to ensure they are "appropriate". But a foreign ministry spokeswoman said there were no such conditions placed on the funding. "MOFA (Ministry of Foreign Affairs) is not placing any such condition as the GOJ's (Government of Japan) inclusion in the selection procedure of a new scholar," Takako Ito, the ministry's assistant press secretary, said in an email. Georgetown University and MIT declined comment on the funding, while Columbia University spokesman Brian Connolly told Reuters by email: "As a matter of longstanding University policy, donors to Columbia do not vet or have veto power over faculty hiring." After a decade of shrinking spending on public diplomacy, Japan's foreign ministry won a total of 70 billion yen for strategic communications in an extra budget for 2014/15 and the initial budget for the next year from April, up from 20 billion yen in the initial 2014/15 budget. Those funds are to be used for "soft power" initiatives such as the Japan studies programs at foreign universities and setting up "Japan House" centers to promote the "Japan Brand". One such effort has already sparked a backlash from U.S. scholars, who protested against a request by Japan's government to U.S. publisher McGraw Hill Education to revise a textbook's account of "comfort women", the euphemism used in Japan for those forced to work in Japanese wartime military brothels.